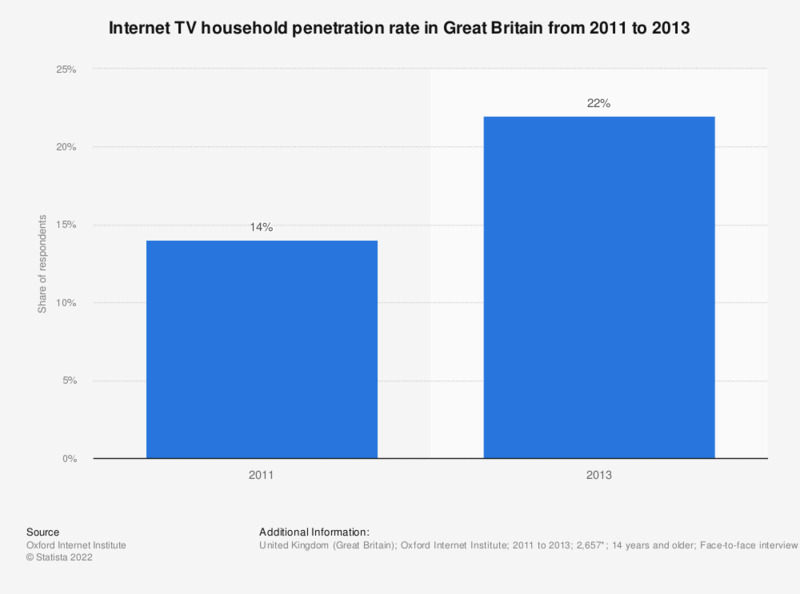 This statistic depicts the percentage of households in Great Britain that had a TV that could access the Internet from 2005 to 2013. In 2011, 14 percent of respondents reported having a TV with Internet and in 2013 the share of respondents had increased to 22 percent. During the survey, this question was posed as follows: "Let me read off a number of things that some households have, and others do not. Could you tell me if your household has: 'Do you yourself have a TV with Internet?'" News get to Italian people more and more through the Internet. Will this change your habits? Which are the priorities related to Rai´s educational mission? How important do you think it is for Rai to broadcast more cultural contents? Which device or devices does your household use to make voice calls using the internet?